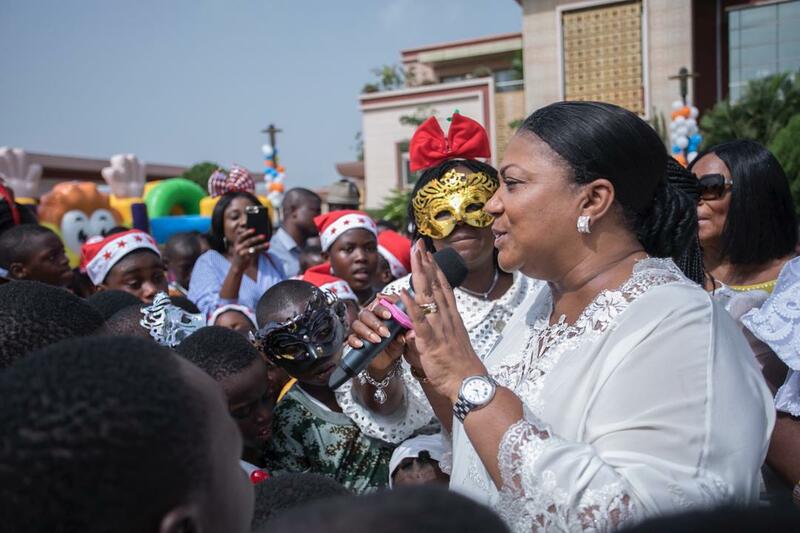 The First Lady Mrs. Rebecca Akufo-Addo has hosted over a thousand school kids to a special lunch party at the Jubilee House in Accra. The annual Children’s New Year party had school going kids drawn from diverse backgrounds and areas all over the country. The kids were treated to assorted food and drinks, while having fun on bouncy castles and roller coaster train rides. They were also offered a guided tour of the Jubilee House to see at first hand the layout, structure and history of the seat of government of Ghana. The function was graced with the presence of the President of the Republic, Nana Addo Dankwa Akufo-Addo, his vice, Alhaji Dr. Mahamadu Bawumia and his wife, Hajia Samira Bawumia, as well as other Ministers of State. The First couple took turns to advise the children to study hard and take advantage of the Free Senior High School programme to acquire secondary education that will afford them the opportunity of further studies to ensure their development. Mrs. Rebecca Akufo-Addo has been hosting this annual event for years now for children across the country.